This just in: we have only about 40 tickets left to our event tomorrow night. We want to pack Great Lakes Distillery to capacity and bring this city together around food. Therefore, we've decided to uphold the promo codes indefinitely and not increase the ticket price at the door. The CODE "EMKE15" gets you a $35 ticket.... until we're sold out. 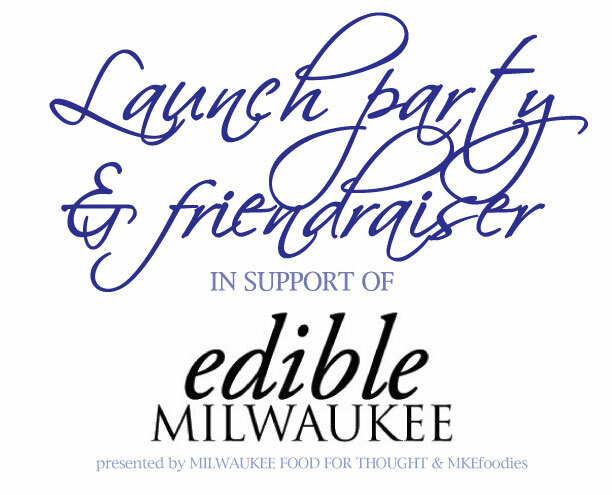 MKEfoodies and Milwaukee - Food for Thought are proud to announce the Edible Milwaukee Launch Party and Friendraiser, which will will take place Saturday, May 18th from 7:00-10:00 p.m. at Great Lakes Distillery, 616 W. Virginia St, in Milwaukee’s Fifth Ward. A cash bar will be available, thanks to the talented staff at Great Lakes Distillery. Thi Cao and Nell Benton, Milwaukee chefs and co-founders of Milwaukee - Food for Thought, underscore that the publication is an indication that Milwaukee is ready for a serious step forward when it comes to food. In addition to local food and drink offerings, guests will have an opportunity to bid on silent auction items from Alice’s Garden, Atomic Chocolates and Times Square Pizza, Braise, CityTins, Indulgence Chocolatiers, Marcus Hotels, Nueske’s, Rishi Tea, Skylight Theater, Stone Creek Coffee, Wellspring, and other local companies and artisans. Tickets for the fund-raiser, which are $50 in advance, can be purchased online. A limited number of tickets will also be available for $75 at the door. 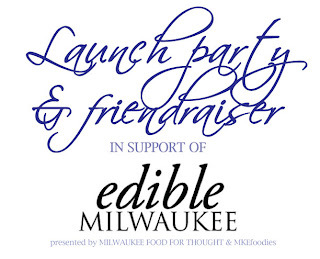 ALL proceeds will benefit Edible Milwaukee’s mission: to amplify Milwaukee's achievements to food fans locally and nationwide; to highlight the unique cultural makeup of the city and pay homage to each group's contributions to our foodscape; and to honor Milwaukee's historical food traditions, whether they are in the past or being revitalized by new producers.